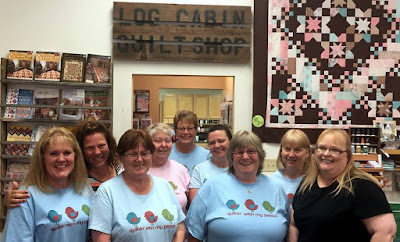 Jean's Quilting Page: Only a few hours left to enter the giveaway and busy-ness! Only a few hours left to enter the giveaway and busy-ness! 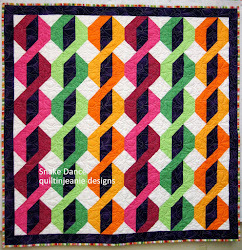 The QAL giveaway of Suzy's Zoo fat quarters ends tonight at midnight, so you need to enter today! Go HERE and enter through the Rafflecopter link. Update: Jenelle won the Suzy's Zoo fat quarter pack! Congrats Jenelle! You might remember this Circle and Spin to the Moon that I was working on a few weeks ago. I debated whether I wanted borders or not. I decided on one narrow border, so picked up this black mottled batik when I was at Cut Up and Quilt last week. I cut border strips and added them yesterday, plus prepped the quilt for loading on the quilt frame. I will have to take a picture when it's finished, as I forgot to take one yesterday with the border. I am using this dark, but colorful fabric for the backing, so pieced it yesterday too. It's ready to be loaded when I get my daughter's duvet/quilt finished. 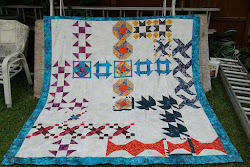 I quilted a few more rows on it yesterdaybut haven't made it up there today. I'm about half way through. and cut them as instructed. Little piles of jiggedy jaggedy cuteness. I put a few rooftops on, but then got tired so stopped for the night. You can see that it's starting to look like a village. I spent this morning getting the post and pattern ready for the next Red, White and True QAL post on Monday...I had written the pattern for the PDF, but added a coloring page for each size today, plus several different versions of the pattern. 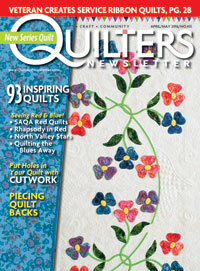 Hopefully that will help inspire and get the creative juices flowing for another quilt using that pattern. It really is addictive, isn't it? After lunch, I went outside and did some weed spraying and went for a bike ride. I've been trying to get my "bike legs" back since I haven't ridden much in the past year, so only rode for 20 minutes. It's hot out so I have been sitting here cooling off for an hour or so....might be done for the day! 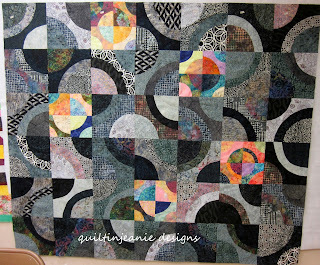 Love the colors and what an awesome quilt. 1. The apostle Paul was not saved like the thief on the cross. 2. The apostle Paul was not saved by saying the sinner's prayer. 3. The apostle Paul was not saved by grace alone. 4. The apostle Paul was not saved by faith only. 5. The apostle Paul was not saved by baptism alone. 6. The apostle Paul was not saved by confession alone. 7. The apostle Paul was not saved by repentance alone. 8. The apostle Paul was not saved on the road to Damascus. HOW WAS THE APOSTLE PAUL SAVED? The apostle Paul was saved like the three thousand that were saved on the Day of Pentecost. He was saved just like every person saved under the new covenant. What did Peter preach on the Day of Pentecost? Faith only advocates say that Saul's sins were forgiven because he called on the name of the Lord, not because of water baptism. That contradicts their own "faith only" belief that you are saved the minute you believe. Saul believed and repented three days prior on the road to Damascus. NOTE: The thief on the cross was saved before the New Testament was in force. He was not saved on or after the Day of Pentecost. The new covenant was only in force after the resurrection and Ascension of Jesus. I gave up my bike several years ago. I can't seem to find one that I don't have to 'bend over' and ride. My hands and wrists just can't take the pressure (I have tendonitis in my right wrist). I love how your village is coming together. That's going to be so cool.